The contest was organised under the Warmian and Masurian Programme of Quality Promotion and under the programme called „Improvement of the quality of catering and hotel services in Warmia and Masuria in 2004” included in the Strategy of the Social and Economic Development of the Warmia and Masuria province. The purpose of the contest was to find the best tourist product and the best service in Warmia and Masuria and their promotion in the local, national and EU markets. In the service category, the criteria were as follows: quality of the service, compliance of the service with the customer expectations, innovations, competitiveness, customers’ opinions, additional services, promotion of the region through the service. The jury of the contest appointed by the Province Marshall decided about the best tourist product on the basis of the above-mentioned criteria. Also, the jury took into consideration the votes of the reader of „Gazeta Olsztynska”, „Dziennik Elblaski”, the Internet users visiting www.wm.pl and the listeners of Radio Olsztyn. 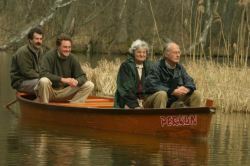 The best tourist product of Warmia and Masuria in 2007 were boat trips in an old Masurian way.